In the past few years, there has been a lot of growth in the FinTech segment with new technologies and innovations coming up in the market. These new innovations have simplified the way consumers access banking and financial services. The rise in need of alternative credit models and lending products all over the world, led to the creation of the online peer-to-peer (P2P) lending in India. P2P lending, like crowdfunding, is all about borrowers applying for personal loans, with no need to go through a financial intermediary such as a bank or any other financial institution. With many new regulations implemented by the Reserve Bank of India (RBI) for India’s fintech segment, there was also the launch of P2P lending platforms as a new category under non-banking financial companies (NBFC). The P2P business model is the opposite of process followed by traditional banks. It is an effective model that matches people who want to lend with people who want to borrow, giving everyone a satisfactory deal. P2P lending is growing at a faster pace due to the trust which is developing among the people. As many people now prefer online payments or transactions, the P2P lending is showing a tremendous rise in both borrowers and lenders. It will be a financial achievement for India as this rise cover urban as well as Tier II and Tier III cities. So what exactly is P2P (or Peer to Peer) lending and how will it improve the FinTech segment in India? In P2P lending, one does not have to visit a bank for the loan, rather they can apply digitally. It is the process of lending money to individuals or businesses through online services where lenders and borrowers are matched as per their need. Now the next point we should put light on is how P2P lending will help in the growth of FinTech segment. Firstly, lenders will be showing a keen interest in P2P lending, due to the high return on investment and determining the creditworthiness of the borrowers with ease. For borrowers, P2P lending is a boon. There are a lot of new startups (SMEs and MSMEs ) and entrepreneurs who want additional funding for their upcoming business. At times due to low credit scores or long process of approval, they do not get the loan easily. With P2P lending they have an opportunity to get a loan with ease as here they do not have to go for a long cumbersome process. Earlier people had to rush to banks to get loans, get their background checked and finally get approval for the loan if everything fell in place. But now things have become stress-free for borrowers. There is no much documentation required and also a process of due diligence for the creditworthiness of borrowers has become robust with the help of technology. Demonetization has played a significant part in seeking alternative channels for borrowings. People are moving towards digital payment methods. There has also been a slowdown in bank credits. Thus, all this has led to a rise in P2P lending. It has taken over the bank loans as it is quick, convenient and less tedious. Additionally, in India people majorly opt for a loan to buy consumer durables, which has seen steady growth. Hence, economic conditions have favored P2P lending as demand for goods and services is increasing day by day and thus the need for borrowings. Why P2P Lending has become so much popular in Indian FinTech segment? We can often see a gap between traditional banking institutions and fund seekers. To diminish this gap, technology has tried a lot to bring something innovative and effective. Well, yes P2P lending model is one such answer. Now let us check out why it is so popular. Currently, P2P lending is managed via specialized online platforms. Companies involved in this, operate online at low overheads, hence there is less interest rate for borrowers and competitive rates for lenders. Don’t you feel that is a great feature? There is a margin of safety available for lenders as the loans are secured against the borrower’s property. Also, there is an option to lend money to low-risk borrowers. Earlier, the process to get a loan was tedious because they have to wait for many days to get a loan and had to even submit various documents. But due to P2P lending, everything has become online where loan approval is given within a few days. One can get assistance for documentation and legal formalities. Borrowers who have low credit score can also apply for the loan, which was difficult or impossible in case of traditional banks. Most SME’s require heavy capital infusion in the starting phase. However, banks used to reject their loans due to low credit score. The reason why SMEs and MSMEs used to get stuck. But with P2P lending, this hurdle has also been taken care of. It helps in connecting borrowers in need of funds directly with lenders over a digital platform and thus, making it simple to get loans. Also unlike banks, P2P lending does not require any collateral. A good credit rating and ability to repay is all that is needed. They do not have hidden charges and all the terms and conditions are transparent, thus making it easier for SMEs to obtain finance. Borrowers can pay fixed monthly installments and there is a lot of flexibility due to no lock-in period. Although P2P lending is at a developing stage in India, it is good time to start using this platform for the investors who are hungry for double-digit returns. It is believed that the guidelines of the RBI such as regulations on loanable funds at Rs 10 lakhs and limit on the term of the loan as 36 months, will have an impact on P2P lending. If proper diligence is done with better knowledge of risk and benefits, P2P would be helpful to a greater extent. Even the intervention of the government in managing the sector and people finding it convenient, P2P lending segment is going to give a great push to Indian Fintech industry. Senior content strategist & editor @RupeeCircle, Rajnish has 7+ years of experience in Digital Marketing. How Safe Is It To Invest Money In P2P Lending? What If A Borrower Defaults? 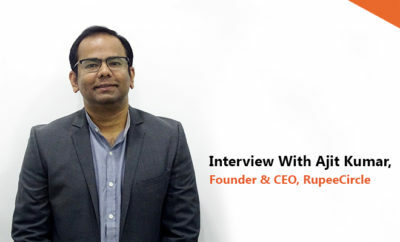 RupeeCircle is the new age Peer to Peer finance company that strives to “make borrowing better and lending smarter”. Backed by Mahindra Finance and Oracle’s Cloud Accelerator Program, we aim to drive financial inclusion to millions of unbanked & under-banked creditworthy borrowers in India. We believe that with increasing internet penetration, digital footprints & big data analytics individuals can act as “Banks or Financial Institutions” themselves and thereby extend financial services to the last mile.